With the next Chapeau major release approaching (currently expected to be around June depending on Fedora’s 22 release date) I’m considering changing the default icon and/or Gnome-shell & GTK themes for Chapeau’s desktop starting from Chapeau 22. The icon theme being considered and tested for Chapeau is Sam Hewitt’s Moka theme. Moka has a great balance of modern, purposeful design that’ll look equally at home on a work laptop or a gaming rig and whilst the outline shapes of the original icons are lost the symbolism on the tile-like icons is clean & recognisable. Also I don’t know of any other significant distribution that uses Moka as default. Whether to change the Gnome shell and/or GTK themes is undecided, currently being tested is Vertex GTK & gnome-shell themes which are clean, purposeful & look sharper than Adwaita. I have some reservations with the fully opaque panels and the additional packaging effort required on my part and whilst cool it might be a might too different. I’m also considering changing the default cursor theme to Oxygen White. These are already packaged by Fedora and thus they require virtually no extra effort on my part to include them into Chapeau. Voice your opinion or get in touch if you’d like to contribute a theme or design work. How soon to a date for an alpha iso version to test? The 21.0 version is still going strong, stable, and enjoyable. Would love it if you could replace nautilus 22 with nautilus 21, or add back to Nautilus 22, what was good in Nautilus 21, (example with a mounted drive shown on the desktop, to have the ability to unmount the drive with a right-click of the mouse. (If user has sudo privileges). and that [x] delete key option to skip the trash can. RPMFusion released a bunch of fc22 packages on the 19th in their development repo and I have working Chapeau 22 builds based on the Fedora 22 repos and RPMFusions dev repos, Korora’a 22 repo is not yet available so I have been using their 21 repo for pulling in Pharlap in the testing builds. The latest build of Chapeau 22 is looking good but currently has one deal-breaker issue which has stopped me fom pushing it out, the ISO works fine in a VM but I can’t get it working from a USB disk yet. 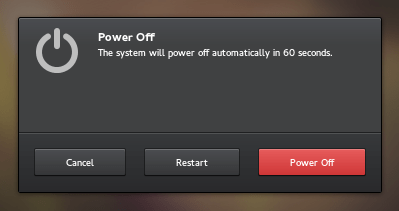 I’m thinking the next build might fix this with some of the latest Fedora updates. Before then I’m going to push my latest build-kit changes to the the 22 branch of the build-kit Git repository today (https://github.com/chapeaulinux/build-kit/tree/22) and update a couple of packages on the Chapeau 22 repository. Things are progressing quickly though, Fedora 22 is supposedly being released in three days (May 26th) so the RPMFusion repos should be properly ready very soon. Now with Chapeau one of the key goals is to stay fairly pure to Fedora & Gnome and build on it rather than change fundamentals so I will not be replacing Nautilus, also I don’t like MATE’s Caja file manager. The issues you mention though I think will not be a concern in Chapeau 22. The ‘Delete’ function in Nautilus/Files 3.16 is available, the key shortcut is the [shift]+[delete] keys. Desktop icons are disabled by default and will be in Chapeau, it always made Gnome a little more crashy in past iterations but I’ve not tried it for a while. 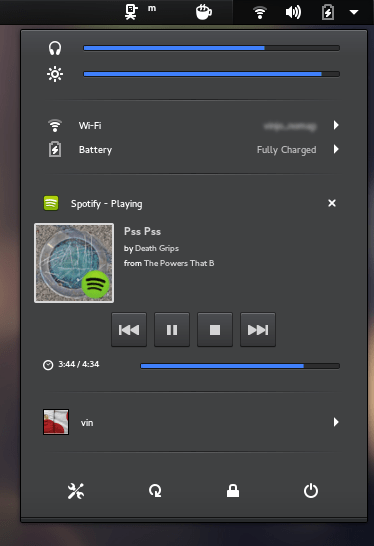 You can enable desktop icons easily using the Gnome Tweak Tool included in Chapeau. Open the tweak tool and goto the ‘Desktop’ section and simply switch the ‘Icons on Desktop’ option to On. On unmounting volumes (as opposed to ejecting disks) this can be done in Gnome Disks, the functionality was already in Disks it’s now just removed from the file manager. 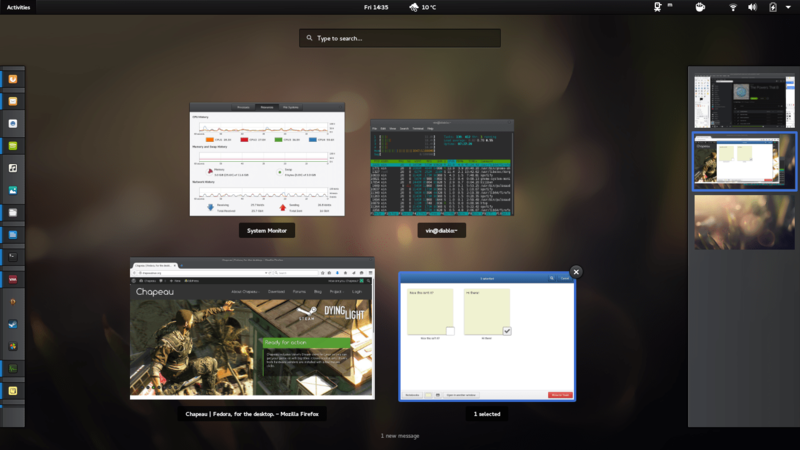 The backgrounds with Fedora22 are few and not to my liking. I do very much prefer the fedora21 backgrounds If its possible, please include those. Your 6 hours ahead of me in timezone. so it is nearly end-of-day for you. Thank you for your response about the backgrounds. You may be wondering why I like two or three backgrounds from Fedora21. Its simple. I reserve that F21 background with all those little letters for root. And that background serves to reminds me that I am in the root logon, and I should not at all be using a web browser or readimg emails. In other words, do what is necessary and get out of there. My gripe with the current Nautilus. I set up my logon as admin. and With visudo I uncomment the line with NOPASSWD. With the tweak tool, I show the mounted drives on the Desktop. Because of NOPASSWD option, when I want to unmount one of those mounted drives, with F21 Nautilus, I would right click on the icon representing the mounted drive and use the mouse(right click) unmount option. With F22, if one the “right-click unmount” no longer exists. One has to open one window, make certain the drive column is shown (it can be hidden), and unmount the drive there. Typically it now takes 6 actions versus 2, if you were mounting a file. I have two files to send you. One is a template for a chrontab. It may be useful. The other is a utility I used during all the F22 testing. You may just discard it if it is of no use. I write in C and am currently completing a project to encorporate sqlite. Until recently I’ve never concentrated too much on Linux internals. Way back when, we had the MOTD option. I will explain what and why in another posting. I reserve that F21 background with all those little letters for root. And that background serves to reminds me that I am in the root logon, and I should not at all be using a web browser or reading emails. In other words, do what is necessary and get out of there. I set up my logon as admin. and With visudo I uncomment the line with NOPASSWD. With the tweak tool setting, I show the mounted partitions on the Desktop. When I want to unmount one of those mounted partitions, with F21 Nautilus, I would right click on the desktop icon representing the mounted partition and use the mouse(right click) unmount option. With F22, The “right-click unmount” no longer exists. One has to open one nautilus window, make certain the drive/partition column is showing (it can be hidden), and unmount the partition from there. Typically it now takes 6 actions versus 2. I have two files to send you. One is a template for a crontab. It may be useful. The other is a utility I used during all the F22 testing. You may just discard it if it is of no use.